Books about the cuisine of Taiwan, in English, rarely come by. That alone would make Cathy Erway’s new book, “The Food of Taiwan,” worth exploring. It’s safe to say that eating is somewhat of a national pastime in Taiwan. 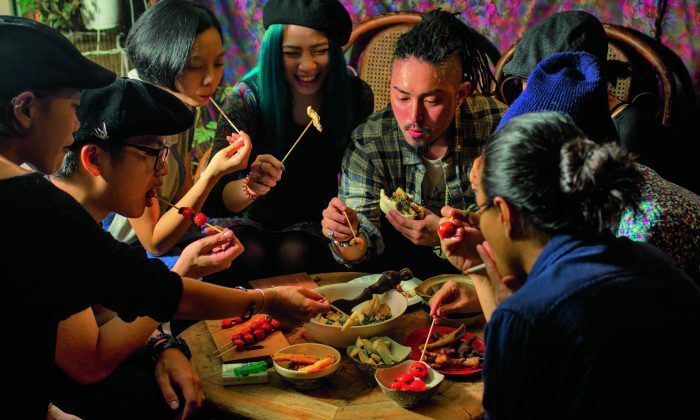 Erway, who inherited Taiwanese tastebuds from her mother, makes a worthy guide to explore the myriad flavors, providing context along the way, especially regarding culinary influences from the past. For example, Erway explains how beef noodle soup (niu rou mian), considered Taiwan’s national dish, contains Sichuan influences—chili bean sauce and Sichuan peppercorns—and is believed to have been created in the military villages that were set up to accommodate mainlanders starting in 1947–1949. When cooking from the book, I looked mostly for recipes that required little hands-on time, and was amply rewarded for my own laziness (or efficiency, depending on who you ask). For my first round of cooking, I didn’t have any Taiwanese ingredients at home and had no time for a trip to Chinatown. Still, it was amazing to see what flavors I could cook up without specialized ingredients. The Steamed Eggplant was ready in about 15 minutes. The garnishes—minced garlic, scallions, and chilies—along with a drizzle of soy sauce really makes this dish. It’s healthy, tasty, and quick. Then I eyed the pan-fried salmon with a typical Taiwanese topping: cilantro and crushed peanut powder. That was also incredibly easy to whip up in a short time, and delicious, with cilantro adding a refreshing herbal note to the more familiar peanut. For the Red-Braised Braised Pork Belly, I did have to go on a shopping run for rice wine. The local liquor shop guys seemed a bit appalled at my request. “You aren’t going to drink that, are you?” Once they understood it was for cooking, they nodded and headed to the basement, where they kept bottles of rice wine specifically for Taiwanese customers, as it turns out. The only other item I had to make a special trip for was dark soy sauce, from a Chinese supermarket. The hands-on time was beautifully minimal—it was quick work to cut up the pork belly and caramelize it with some aromatics before braising it for over an hour. The result: tender, deeply fragrant, savory-sweet amber pieces of pork belly that were quickly decimated by hungry eaters. This dish worked well served with a side of greens like sautéed bok choy. There’s plenty to explore in “The Food of Taiwan”—plenty of delicious flavors and varied textures, but just as worthwhile is Erway’s commentary, which provides rich context to understand where food in Taiwan has been and to ponder where it might be headed. “The Food of Taiwan: Recipes From the Beautiful Island” by Cathy Erway, Houghton Mifflin Harcourt, 2015, $30. Recipes and photography from THE FOOD OF TAIWAN by Cathy Erway. Copyright © 2015 by Cathy Erway. Photographs by Pete Lee, 2015. Used by permission of Houghton Mifflin Harcourt Publishing Company. All rights reserved. 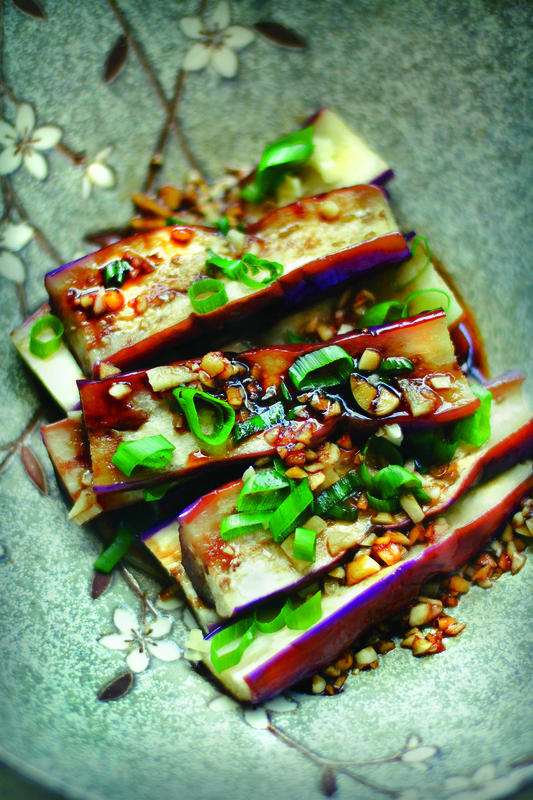 Long, tender chunks of Asian eggplant are absolutely delightful when steamed through. Their flesh cooks to a custardlike softness, without absorbing too much oil like they do when cooked in a pan. This is a typical Taiwanese preparation that’s not for those averse to strong flavor: lots of fresh garlic and mildly hot fresh red chilies are sprinkled liberally on the steamed eggplant as an attractive and very tasty garnish. Prepare a large bamboo steamer with boiling water underneath. Trim the ends from the eggplant and cut into halves lengthwise. Sprinkle with the salt and arrange in the steamer. Cover the steamer and let cook until the eggplants feel soft to the touch all around, 8 to 10 minutes. Arrange the eggplant skin-side down on a serving dish. Sprinkle the garlic and chilies over each piece followed by a drizzle of the soy sauce, and serve immediately. Who needs bacon when pork belly can be cut to sizable chunks, with its fat rendered to gelatinous layers in between tender meat all stained with a savory, soy sauce–based broth? This Taiwanese preparation is often found as an addition to a large, multicourse meal, as it’s too rich and potently flavored without plenty of contrasting sides. Still, it is a highlight of the table whenever served. 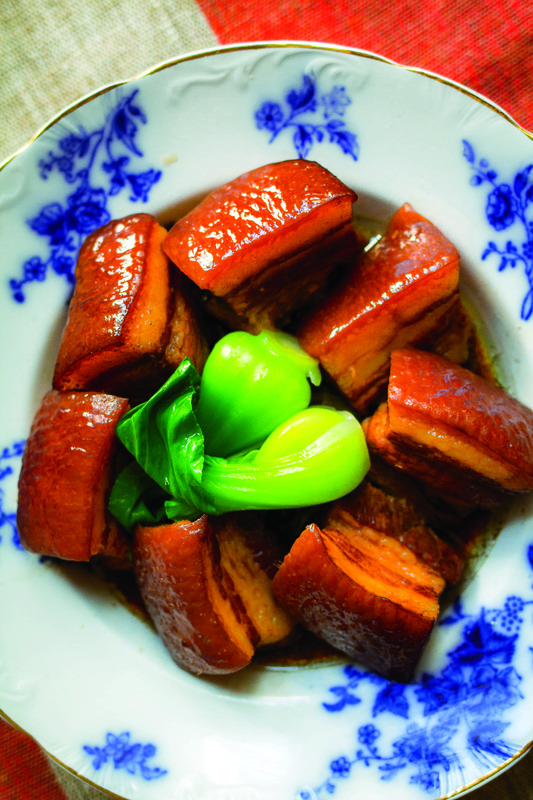 The liberal use of the humble, tough cut of pork belly may be Hakka-inspired, yet it is red-braised in the fashion associated most closely with Hunanese home-style cooking. All told, a true Taiwanese specialty. Remove any bone and cut the pork belly into thick pieces about 1 1/2 to 2 inches long. Heat the oil in a large saucepan or wok over medium-high heat. Arrange the pork belly pieces in a single layer in the pan so that each piece has direct contact with the bottom of the pan. Cook without turning until just lightly browned on one side, about 30 seconds. Flip the pieces over and brown on the opposite sides for just 1 to 2 minutes more. Remove from the pan and set aside. To the same pan, add the scallions, garlic, and ginger and stir until just sizzling and fragrant, about 30 seconds. Add the sugar and cook, stirring, until bubbling, 1 to 2 minutes. Add the rice wine and bring just to a boil, stirring to incorporate the sugar. Add the water, light and dark soy sauces, and the five-spice powder and return to a boil. Return the pork belly pieces to the pan. Reduce the heat to a gentle simmer. Cover and cook for until the pork is very tender and red stained, at least 1 hour, preferably 2 to 3 hours. The eponymous “cups” in this recipe’s name denote equal parts soy sauce, sesame oil, and rice vinegar. 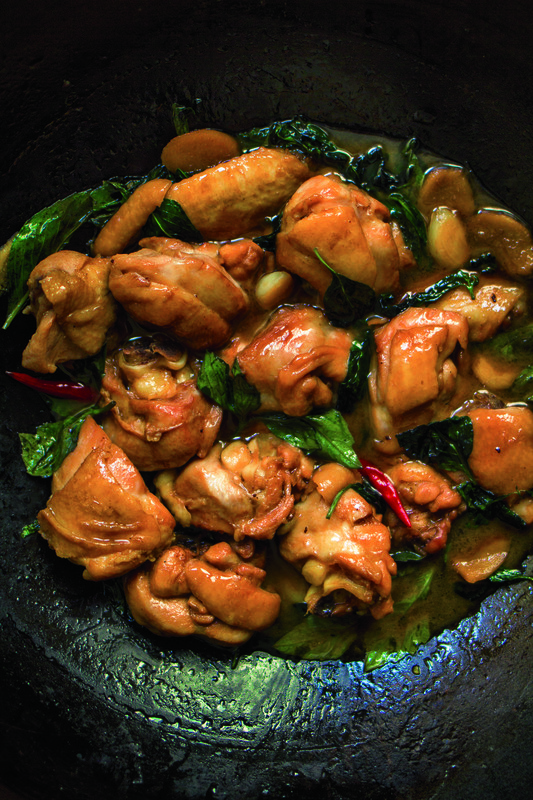 It’s a potent, salty and savory braised chicken dish with these ingredients alone, but the dish really gets its signature from the sheer volume of garlic cloves, thick pieces of ginger, and fresh basil leaves for flavor. This recipe’s name might underscore the fact that most recipes were passed orally in Taiwan, rather than written, until recent generations. After one taste of it prepared elsewhere, it is quite irresistible to try recreating at home. This dish bears similarities with Hakka-style preparations and red-braised styles of cooking, but its use of basil is refreshingly distinct. It has been enjoyed in Taiwan as a quintessential Taiwanese dish for quite some time.